WILLEMSTAD - In 2011 the Government Accountants Bureau (SOAB) produced a report stating that all school boards on the island are struggling to meet their financial obligations. The school boards - the Association for Protestant Christian Education (VPCO), the Roman Catholic Central School Board (RKCS), and the Public Schools Service (DOS) - in interviews with SOAB indicate that the funding is inadequate. Sometimes even the budget that was allocated for learning materials must be used for the payment of the electricity bill. 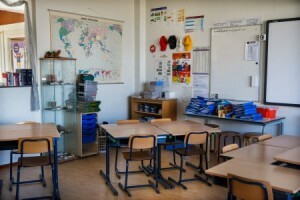 The fact that school boards are 'reasonably able to meet their financial obligations' is due to the collection of parental contributions and the use of resources intended for regular maintenance and learning materials for other material costs such as electricity, management and administration, says SOAB in 2011. Since then, there has been little improvement. This week, VPCO once again asked attention for the difficult situation by sending an urgent letter to Prime Minister Eugene Rhuggenaath. VPCO director Maghalie van der Bunt-George called it 'shocking that there is no investment in education', which has 'insufficiently grown with the changes on our island and in the world'. All school boards collectively have already indicated this to the Minister of Education Marilyn Alcala-Walle but to no avail.